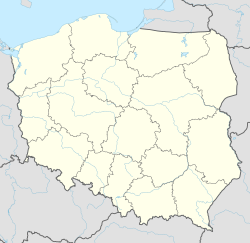 Poronin [pɔˈrɔnin], is a village in southern Poland situated in Tatra County of the Lesser Poland Voivodeship since 1999 (it was previously in Nowy Sącz Voivodeship from 1975-1998). It lies approximately 7 kilometres (4 mi) north-east of Zakopane and 80 km (50 mi) south of the regional capital Kraków. Wikimedia Commons has media related to Poronin. This Tatra County location article is a stub. You can help Wikipedia by expanding it. This page was last edited on 29 March 2017, at 07:33 (UTC).